This campaign poster proves the scientific research correct. CANBERRA, Australia -- With the Australian election campaign in full swing, all the attention is on the leaders of the two major parties. But scientists in Sydney, NSW, have found startling results from genetic extracts from the Prime Minister's and the Opposition leader's blood. "We were carrying out a routine pathology test on Ms Gillard's blood cells," says one scientist to an UnNews reporter, "when we found large doses of elephant DNA. Surprised, we continued our testing. Then we tested Mr Abbott's blood. It was the same! We have never seen anything quite like it!" 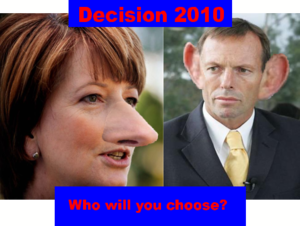 Julia Gillard's over sized nose and Mr Abbott's abnormally large ears had already caused some speculation about this theory, but these genetic discoveries proved indefinitely that our two competing leaders are only partially human. This has caused much distress throughout the election campaign, bringing Labor and Liberal preferences plummeting down and general confusion in the parliament. Then interviewed, Mr Abbott refused to comment. Ms Gillard just snorted, called it nonsense, and went back to tearing off leaves from a nearby tree with her nose. The Greens are now expected to win the campaign. This page was last edited on 5 June 2012, at 07:40.